Lisa D. Writes: Win free BOOKS!! Two of them! It's October! How the heck did that happen? Also, don't forget you still have ten chances to win one of the only ARCs of Last Rite that will be given away before release day. Go here to check out all the ways to enter! P.S. The Last Rite cover ROCKS! Awesome giveaway. I have been wanting to read Original Sin, have seen many reviews for it and have been dying to check it out. I have not read any books by Kristen Tracey yet, that is a new author for me. I love to read and am always looking for new books and authors to read. Wow thank you. Would love to get my hands on those books. Thank you so much for the chance to win! I would love to read these books! Oh Sharks and Boys sounds super good! Thanks for the chance! Would love to be entered! 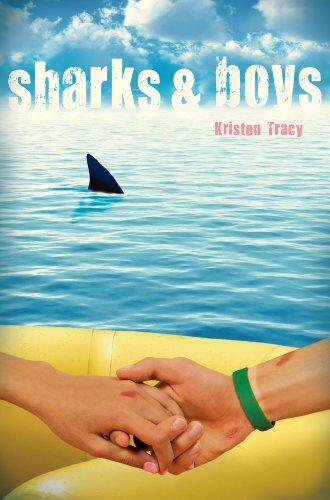 I read an ARC of Sharks & Boys, and it's surprisingly a pretty deep book, in my opinion. Even with the title, you think it's going to be kind of funny, but it's pretty serious. And can I just say that I love that you were "book festivaling?" Think you've got a new verb, there! the title really makes me wonder but also make me want to read the book!!!! Thanks for this awesome contest!! I'd love to win these! Gives me more books to review and tell the world about! Does the title mean they both bite ! If the giveaway is open Internationally, I would like to be entered. Sharks and Boys is new to me but it sounds like one that I would enjoy! Thanks for the chance to win both of these wonderful books! I've heard wonderful things about this book! And your book too! :) I would love to win a copy! Thanks for the giveaway! I'd love to read both books! Great title. Thanks for the chance! I would love to win Sharks and Boys and my own copy of Original Sin (I gave mine away). Thanks for the giveaway! I would love to win Sharks and Boys and my own copy of Original Sin. Thanks for the giveaway!